Time got away from me this week and I’m running around like a chicken with my head cut off. With my deadline looming less than twenty-four hours away it seemed appropriate for me to share some thoughts on slowing the pace of our life. I realize that’s not an original theme (as if there’s any such thing), but I also realize it’s something we all seem to struggle with, regardless of our age or occupation. The continual challenge for me is trying to decipher the difference between the “good” thing to do and the “right” thing to do. Just because an activity is noble, worthy and/or fun, doesn’t necessarily mean that it’s the best investment of my time. We only have so many hours in the day and most of us have a limited reservoir of energy, so we have to choose our priorities wisely. When I was in Nevada, I made my book my priority. Consequently, I nearly completed my rough draft – all 425 pages of it – something I’ve been unable to accomplish in the past six years. Since I’ve been home, however, my priorities have shifted and my book has been placed on the back burner once again. So I’ve decided to wait until the students in my family return to the routine of school before I attempt to complete my book project. Here’s a great quote along these lines. It comes from Philip Humbert, Ph.D. Many years ago, my father gave me a copy of the following poem that he found amongst my mother’s personal things after she passed away. From the time my husband, Keen, was in the seventh grade until he graduated from high school, he spent every summer working with his cousin Jack on the farm his Uncle Keen and Aunt Helen owned near Alma. The hours were long – sunup to sundown – and the work was hard, but Keen so enjoyed the time he spent on the farm. Several years ago – on August 26, 1991 to be exact – Keen decided to attempt a writing exercise that included some of those cherished memories. This is the result. absent, the wild is free. Wilderness is evolving at its own pace. blesses everything in it's path. rest. I shut my eyes...my thoughts slow...sensations dull. Sweet peace softly enters in. Finally, I’d like to share one of my favorite poems. The author is unknown. Recently I came across this excerpt from one of my journals that seemed fitting to share this Father’s Day. The date was October 31, 1988. Sunday afternoon Keen was tired and wanted to take a nap but he said he’d been feeling like Jared needed some special time to be with just him. So after lunch, Josh and Keener went down for naps and Keen & Jared drove out to the land Keen’s folks own. They had such a fun time together. They shot the gun, played hide & seek and even had a dry cow pie fight. What a day! Jared thanked Keen over and over for taking him out. Then when they got home Keen orchestrated the carving of the pumpkins. We had 2 big ones and 4 little ones. Keen carved a question mark in the littlest pumpkin for the baby on the way. It looked so cute all lit up at the end of the line. I wanted to record the activities of this weekend partly to remember what a great father Keen has been. He’s so devoted to meeting the needs of every person in the family. I think he’s the greatest. He’s a super Dad and a super husband. 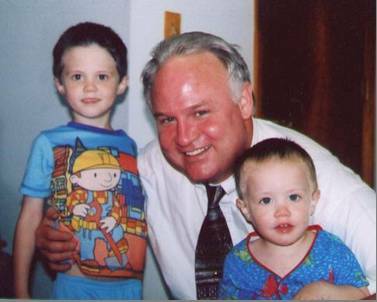 Our boys were very blessed to have a father who gave them 100% when they were growing up. Even though he was always physically drained after hauling trash, he still took time to wrestle and play with them. On the weekends, he would try to do something special like take them fishing, roller skating, or to the park or a movie. Their all time favorite summertime activity was jumping into the creek from a rope swing. Now Keen is continuing the tradition by being a wonderful grandfather to the next generation of Umbehr boys – our two grandsons, Asher William and Gabriel Michael. Asher and Gabe spent six days with us last week, along with our daughter-in-law Erin, who was on a break from nursing school. Unfortunately, Jared wasn’t able to join us because he’s currently attending radio communications school at the naval base in Virginia Beach. Asher and Gabe share many of the same facial features, but that’s where the similarities end. While Asher is somewhat finicky when it comes to eating (he even told me he was “allergic” to several items on a buffet line), Gabe will eat anything you put in front of him. Consequently, Asher is more lean and Gabe looks like a little football player. Their mannerisms are like night and day, too. Asher is docile, easy going and soft spoken –except when you ask him to repeat something (“I said…!”). Gabe, on the other hand, is a little firecracker who only has one gear – full speed ahead! He’s also very curious and knows no fear – which can be a dangerous combination for a twenty-month old who’s going on twenty. I get the feeling that Gabe just wishes everyone would recognize his vast capabilities and let him rule the world! The two of them together remind me so much of Jared & Josh when they were little – two peas in a pod. Of course they have their squabbles, like all siblings, but most of the time they are very loving and considerate toward each other. One time Gabe was hugging Asher around the neck for so long that I had to ask Erin if it was a hug or a choke hold! It’s been a long time since we’ve had little ones running around the house and I must admit to feeling a little rusty. It’s a bit of a shock to the system to return to the hectic days of diaper changes, bath time, spilled milk and toys scattered throughout the house. But we had lots of help from the whole family and everyone enjoyed making the most of the time we had with them. On Friday we all piled in the Durango and headed for Gage Park to swim in the pool and ride the carousel. I honestly don’t know how Erin juggles the demands of school and being both mommy and daddy while Jared is in the Navy, but she’s doing a great job. She’s earning a 3.9 in nursing school and a 4.0 in parenting and raising two happy, well-adjusted little boys. I’d like to close by sharing this poem my mom sent me when my kids were small. Her letter was a great source of encouragement to me, but nothing could compare with the joy of meeting Rebecca and visiting with her face to face. Coincidentally, she lives right across the street from The Cottage House where Keen and I went to celebrate our 26th anniversary. Although I only spent an hour with Rebecca, she made a very strong impression on me. Rebecca Miller was born in November, 1919 at her grandparents’ home southwest of White City, Kansas. She spent the first 50 years of her life on farms around Wilsey, raising cattle, hogs and chickens and tending her garden. The next 30 years she lived in the town of Wilsey. After her house burned down several years ago, Rebecca moved to an apartment in Council Grove. She never complained about the fire, instead, she chose to maintain a positive outlook. “Maybe it turned out for the best for me to move into Council Grove,” she stated. Rebecca loves her apartment and all her neighbors. “Nobody goes by Mr. or Mrs. here,” she explained. “We all just go by our first names.” I’m sure her neighbors love her, too. 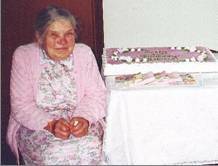 She’s known as “The Cookie Lady” because of the cookies and treats she bakes for the other residents and mail carriers. She gave me some of her delicious applesauce cookies when I visited. Rebecca has an ailment which prevents her from standing upright. She calls it “the Harmon stoop” since several members of her family were inflicted with it, too. But she doesn’t let it bother her or hold her back. Instead, she talks about how grateful she is that she doesn’t suffer from arthritis and how blessed she is to have perfect eyesight, without the need for glasses. With Rebecca, it seems the glass is always half full. Rebecca remarked that God didn’t give her the talent to sing or play music by ear, but thankfully He gave her the talent to read music and play the violin. “The talents I don’t have make me more understanding of others who can’t do certain things, and the talents I do have make me grateful for the gifts God did give me,” she said. When I asked Rebecca if she would play a tune for me, she agreed and proceeded to play a beautiful rendition of Amazing Grace. She enjoys playing for her church in Wilsey where she taught Sunday school for many years. But I was very surprised to learn that Rebecca is still using the same violin her parents bought for her so many years ago for $5.00. Now that’s a picture of contentment!